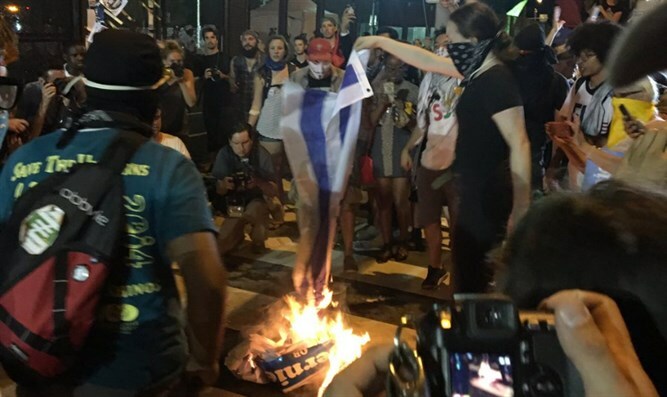 Bernie Sanders supporters protest Democratic party corruption in favoring Clinton; elements within the crowd seen burning Israel, US flags. As the Democratic Convention rumbles on in the Wells Fargo Center in Philadelphia, controversy continues to rage through the streets of the city. Supporters of erstwhile primary candidate Bernie Sanders are enraged by revelations in a WikiLeaks publication, which featured thousands of emails sent between members of the Democratic National Committee, in which a desire by party officials to facilitate the nomination of Hillary Clinton emerges as a clear pattern. Despite considerable efforts by Sanders to calm things down and promote party unity, protests continue outside the Wells Fargo Center, where the convention is being held. Due to the far-left character of much of the Bernie Sanders support, anti-Israel and anti-American elements are attracted to the protests. On the first night of the convention Palestinian flags were raised in the audience. At the protests on the street last night, flags of countries less approved by some of the protesters were burned. Observers said they saw more PLO flags than US flags at the convention.